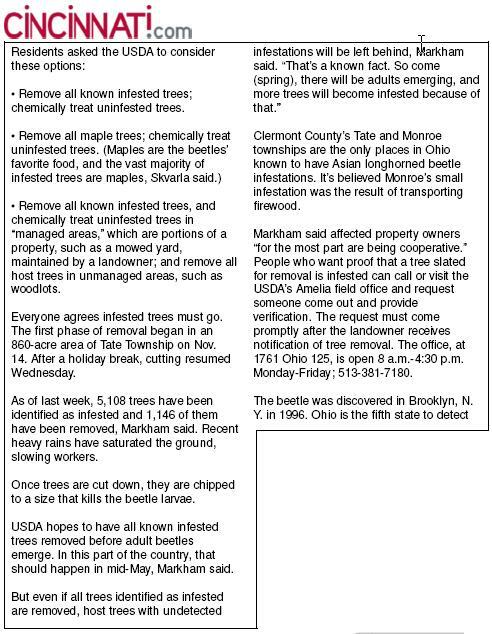 Here is a recent update on the Asian Longhorned Beetle in Bethel Ohio. Although there is a delay in the report from the USDA that would give home owners options to pursue, perhaps including treatment of healthy trees, there is no delay on the USDA’s removal of infested and host trees. And what is a host tree? It is simply a tree that the Asian Longhorned Beetle can feed on. And from the chart in a previous post, one can see that there are a lot of trees that it chooses. That means that almost all trees in the greater Bethel area are tagets for removal, even if they are currently healthy. Here is a great video showing how tree injection works for Emerald Ash Borer, and also Asian Longhorned Beetle. Although the US Department of Agriculture has not approved the protection of trees in Bethel, Ohio, it has approved this method in other parts of the country such as Wooster, MA. Widely-planted ornamental shrub. No US cord. Host in Chinese literature; Heavy feeding damage and exit hole observed in China. oviposition sites and 2 exit holes observed in cage study in China. Uncommon shrub. No US record; reported not to be a host in Chinese literature but damage observed. 1 Host status based on US records of infestation, field studies with North American trees planted in China and Chinese literature. Host range tests in laboratory and greenhouse settings not considered except as noted. See Hu et al. (2009) for a review of hosts with particular emphasis on the status of poplars in China. 2 Host genera listed alphabetically within catagories. 3 Host abundance based on program records , general oversvations of infested areas in NY and IL, and on Nowack, D.J., 1994. “Urban Forest Structure: the State of Chicago’s Urban Forest.” pp 3-18 In: E.G. McPherson et al., Chicago’s Urban Forest Ecosystem: Results of the Chicago Forest Climate Project. Gen. Tech. Rep. NE-186, USDA Forest Service, Northeast Forest Experiment Sta., Radnor, PA.
4 Included in surveys and chemical treatments by USDA Cooperative ALB Eradication Program in IL, NY and NJ. This is a question that our salespeople and technicians get asked quite often. The quick answer is Yes, but only if tree injection is used. As can be read in other posts such as Our process to protect valuable ash trees the method that we use keeps the formulation within the system of the tree. The formulation is injected into the tree trunk via small plugs, which act as one-way valves, and it stays in the tree. The formulation that we use for Asian Longhorned Beetle is imidacloprid. Other systems such as soil drenching, put pesticides into the environment. In a letter to the USDA, concerned citizens in Pesticide Action Network North America, Toxics Action Network and The SafeLawns Foundation, stated the following. c) Potential impacts to humans. Imidacloprid has been linked in animal studies to reproductive, mutagenic and neurotoxic effects. Although the article is specifically about the Asian Longhorned Beetle, the same process and pesticide is used by some companies for Emerald Ash Borer. Therefore it is important to ask any company that may treat your trees for Asian Longhorned Beetle, what is the method they use. 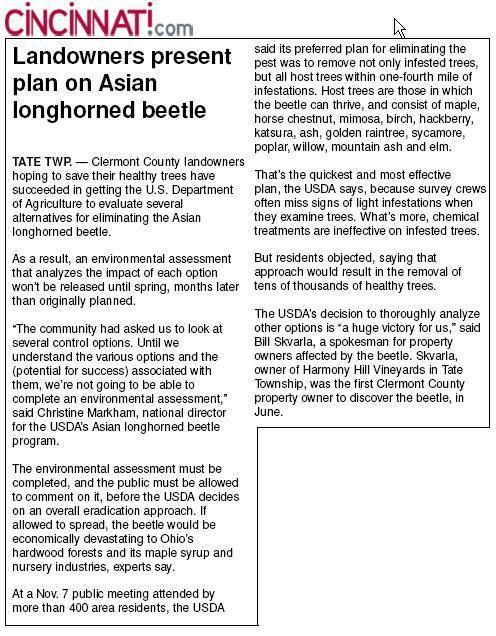 The area that is quarantined for Asian Longhorned Beetle (ALB), is east of Cincinnati. Even though the ALB can fly, the biggest threat to the Greater Cincinnati area comes through the transporting of firewood. Governor Kasich issued an Executive Order making it illegal to move any logs, firewood, stumps, roots or branches out of this area.